Tri Clover - Blow Off Tube with Thermowell - 3"
3" Tri Clover fermenter blow off tube with 14" Thermowell. Clamp and gasket sold separately. This item works GREAT with Ss Brewing Technologies BrewMaster Series Chronical fermenters! So you have that nice, shiny conical fermenter. You just brewed a batch of beer, and you set up a blow-off tube attached to the top of your fermenter, terminating into a jar filled with sanitized water. Everything looks great… you go to bed. You check on your baby the next morning only to find that the blow-off hose crimped upon itself. Your wort is fermenting… but unwanted back pressure has formed behind the hose crimp. Dang it! If only there was a way to keep that from happening! 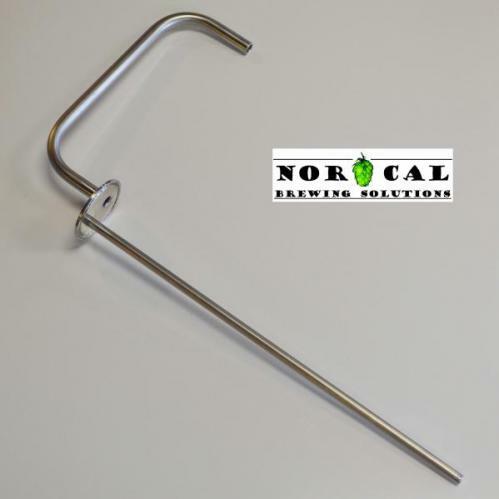 NorCal Brewing Solutions to the rescue! Our fermenter blow-off tube replaces soft hose with a METAL arm that clamps to the top of your fermenter with a Tri Clover clamp. The entire arm is made of 304 stainless steel extending all the way past the edge of your fermenter. Simply attach an inexpensive 1/2" inner diameter hose (plain vinyl works fine) and drop it straight down into your sanitized water jar. Since your hose now falls straight up and down vertically, there is NO WAY IT CAN CRIMP ITSELF! Tri Clover - Cap - 3"